Before going through with your kid’s awkward phase – first crush, acne, the dreaded inaugural “I HATE YOU” – you have to first delve into the makings of raising a toddler. Karen Weiss Kart faced no exception. Like all parents, she had one problem: coaxing her daughter to eat from her plate without having her tossing it aside. After an embarrassing incident in a restaurant that caused a major disaster (let me just say one word – peas), the mother-of-three decided to take matters into her own hands. 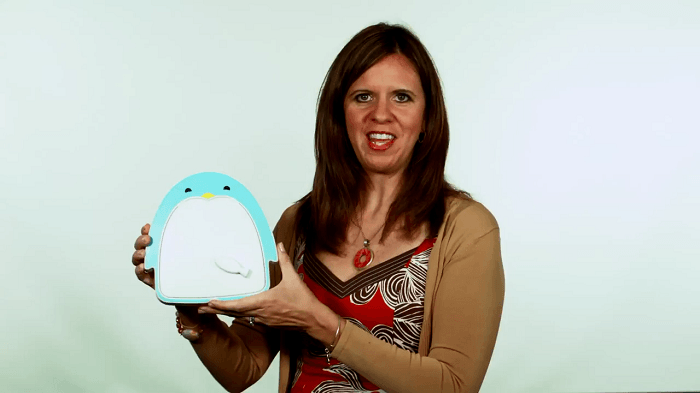 Presenting Adi, a a fanciful portable spill-proof kid’s plate that stay puts on the table so everyone can enjoy their meals with free of worries. Adi is live on Kickstarter with 10 days to go and it’s spiffing. There are two things I know about kids: they’re naturally funny and they tend to make a lot of mess. During my short stint as a kindergarten teacher, I witnessed messy eating and the occasional throwing behaviour. “Is there really a way to put a stop to this overwhelming state?” is something you would ask. With Adi, it might. And it’s all thanks to its far-reaching features. One the most frequently asked questions is, can food get stucked under the suction? The answer is no. The sole purpose of Adi is for it to be easy to use. 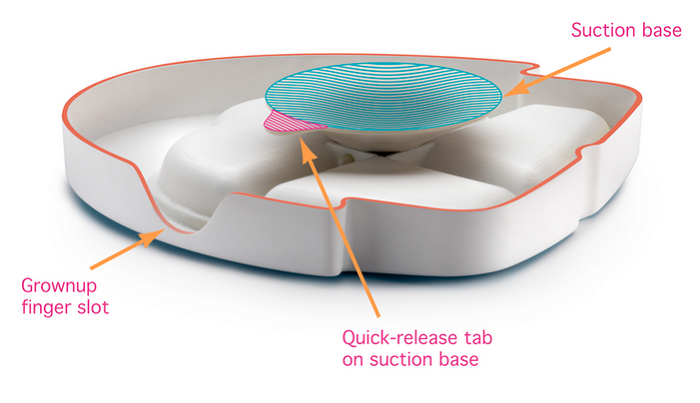 Kart have shared that she has carried out tests to fasten the suction base and made sure that the one she chose would allow a sponge or dishwasher to effortlessly get rid of the food. I’ve never enjoyed washing dishes, let alone scraping food off in the corners that are difficult to clean. For this reason, I’m totally on board with Adi. This snap-tight, spill-proof lid feature bears repeating. Don’t you just hate it when your lunch box spills? Back in school, whenever I brought my lunch box to school, I would always made sure that I had it in a plastic bag. (If I had a dollar for every time it spilled…) It didn’t worked, of course. My bag got ruined and it stunk. Yuck. With Adi, food will be kept in its individual compartment; it’s going to make your life easier. 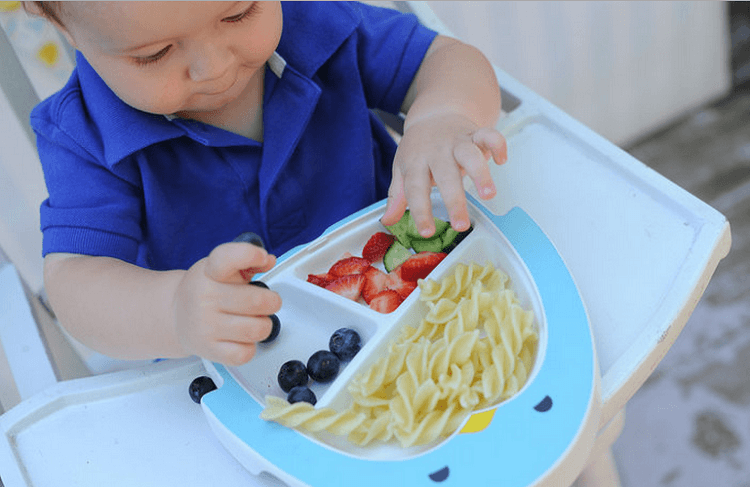 It’s BPA-free, phthalate-free, PVC-free, 100% eco-friendly and dishwasher safe to boot. And did I mention about the fish handle? It’s as cute as a button. I thought NTUC Foodfare has the cutest lunchbox I’ve ever seen. I was wrong. For Adi, it makes perfect sense to use a penguin design. It’s a known fact that kids love penguins. I mean, come on, there must be a reason why Happy Feet grossed over $300 million bucks worldwide. The bottom line is, penguins are darn happy animals and you know it. My only thought is: wouldn’t it be better if there’re more colours? Is there a downside to Adi? Short answer: yes. Long answer: it depends on how you look at it. To be perfectly honest, this is the one minor attribute I think I should overlook. I don’t really have a problem with Adi not being microwave safe (hence the word ‘minor’). We could easily use another plate to reheat it and when it’s done, simply transfer the food back to Adi. I can live with that, but some mothers, who are strapped for time, might not. Kart’s daughter, Sophia, has created a joke for each day of the Kickstarter campaign. Here’s one of my favourites: Why didn’t the skeleton go to the scary movie? Because he didn’t have the guts. 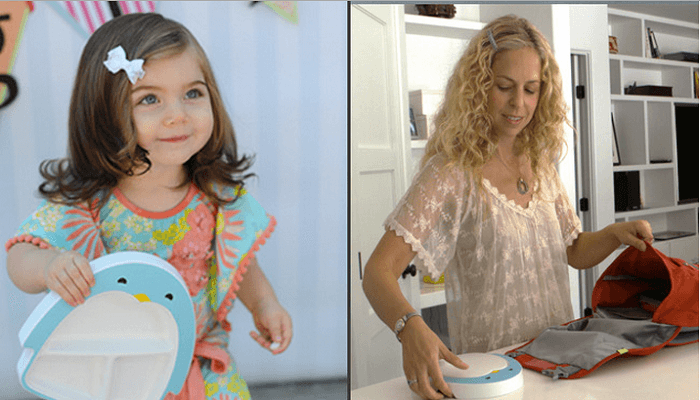 Think you and your little one could use a little help during mealtime? Hop on over here to back Adi!